As 2018 marks 100 years of the Royal Air Force, we would like to share some of the 101 years of RAF Kenley’s history. Delving into documents recording the history of Kenley reveals why Kenley was maintained as an RAF base for the Battle of Britain and World War II. 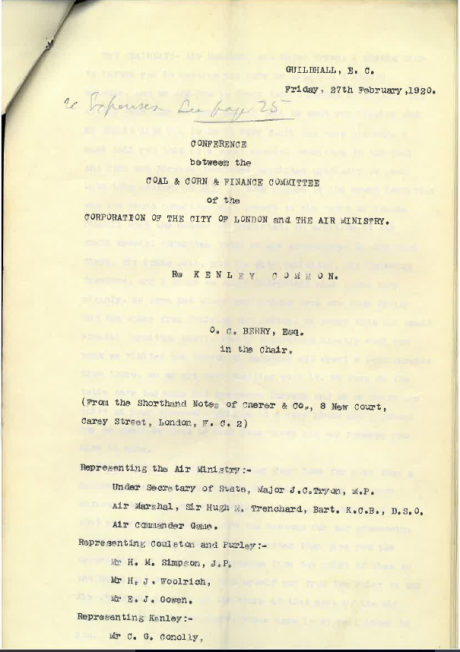 In 1920, Air Marshall, Sir Hugh M. Trenchard, often referred to as the father of the RAF, put forward the case for Kenley Aerodrome to be retained as a government-used airfield. His comments can be found in a meeting transcript from a conference between the Coal & Corn & Finance Committee of the Corporation of the City of London and the Air Ministry. The reasons he gave were that statistically “Kenley was the most successful of the grounds for the defence of London” and “from a weather point of view…there were less low clouds and less ground mist than the other grounds” in the area. At this time around £348,000 (which now equates to more than £17 million), had been spent on Kenley airfield which meant it was the only aerodrome in the area with large enough sheds to accommodate some of the bigger machinery. According to Sir Trenchard, it may have cost around £200,000 to upgrade other airfields in the area to have the same facilities. Unfortunately, those sheds are no longer standing, but you can explore the blast pens where the spitfires and hurricanes parked and visit the tribute to all those who served at RAF Kenley. Our guided tours can provide a deeper insight into the history of the site and can show you inside the air raid shelters built into the blast pens. Keep your eyes on our website for events that we will be running throughout the year at RAF Kenley, new family trails and family activity days including a Heritage Open Day commemorating Battle of Britain Day on 15 September 2018.